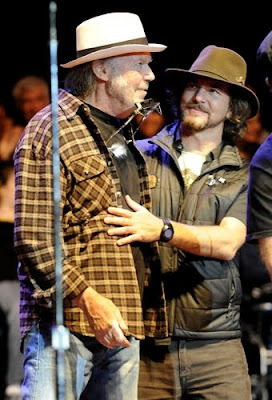 Eddie Vedder and Neil Young share a moment at Bridge School Benefit Concert 2011. Eddie and Uncle Neil performed "Don't Cry No Tears" together. This was Vedder's 10th appearance at the Bridge concerts. Okay, y'know what? This has nothing to do with this story, but I'm surprised Neil has had nothing to say officially (or unofficially as far as I know) about the passing of Bert Jansch. I'm in the UK and never had the opportunity to see them play together, but I know it would have been special. Like I say, I'm surprised - not disappointed or upset, just surprised - that there hasn't been a posting to NY Times about Bert's death. As a guitar player and I assume a friend, Neil would have been pretty cut up about it. Of course, he has the right to grieve in private and to be honest I don't know why I care about this at all, but I'm surprised. Not disappointed or upset, just surprised. Okay, maybe a little disappointed and upset, but mainly surprised. That is all. Neil actually did release a statement on Bert. See Neil Young News: Bert Jansch: 1943 - 2011. Also, Bert was remembered at Bridge concerts onstage and was the final image in the Bridge tribute video. Maybe an oversight on posting to NY News?? I have to admit I'm touched by the relationship between Neil and Eddie, the picture here captures it beautifully. You can see the love and respect between the two and how much Eddie looks up to him. Interestingly next to Neil (and this is a compliment) Vedder looks so young almost like a musician just starting out and standing with his hero ... then you realize he's been to 10 bridge school shows and has been leading his own ultra successful band for something like 20 years ... In industry that's often skin deep its touching to see what seems like such an authentic connection. Surprising, Neil is a great role model for stoners/druggies like Eddie who probably knew that the celebrity that made him "famous" was going to end up killing him. I mean, Neil was in the middle of all that crazy, too, and he walked away from it. Not that it doesn't follow him around from time to time, but Neil at least was able to define where that line existed between the crazy that made him "famous" and the "crazy" that ends it all. Eddie as PJ's front man was way out there until a man named Neil Young threw him a life line; Neil knows you've got to find a way to live with that crazy life style that made you a "celebrity" in the first place. Patti Smith would not be "Patti Smith" without all the experimenting she did with her art. At some point, artists have to find a way so that it doesn't kill them. totally agree ... seems like almost nobody made it out as well as Neil. There's lots of explanations but for a guy who was somewhat sickly (polio as a child, ect, ect...) Neil looks sturdier and is as relevant as ever ... of his peers who survived few are relevant or even in decent shape ... so UNcle Neil knows a thing or two about how to keep it real ... I know almost nothing about PJ other than their relationship with Neil seems unique and really cool but it seems they really look up to him and for good reason.